As soon as the first showers hit the roads, a lot of bikers cover their rides with tarpaulins and miss the bliss of monsoon. While it may be a good measure for safety, we cannot disregard the fact that rain rides are one of the best motorcycling experiences; so long as you know how to prepare your ride and what to expect on the journey. 1. Anti-rust protection: It can be said that not all of us are blessed with covered parking spots, so excessive exposure to rains can cause your bike to catch rust at certain vulnerable places - e.g. scratches or paint chips. Hence it is imperative to get an anti-rust protection layer to retain your bike’s shine and colour. 2. Optimise tyre pressure: Due to the humidity in the air during monsoons, your tyre pressure falls. Thus, giving you the cue to maintain the PSI levels at optimum for better traction on wet roads. 1 PSI below normal is the best for Monsoon. 3. Rain riding gear: If you haven’t changed your riding gear in a while, it’s high time you should. A proper waterproof rain suit; gloves, boots, can protect you from even the heaviest rain storms. To enjoy a ride in the rain, you need to make sure that you’re not soaking and draining at the end of it. Add an extra layer or go with the heavy-duty torso and pants, exclusively made for riders. 4. 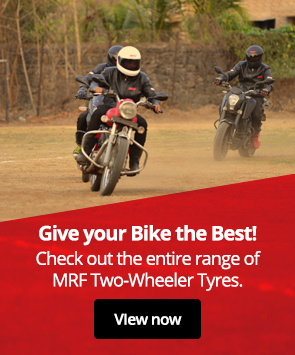 Check your tyres: Tyres play the most crucial role for your safety in rains. Check the tread depth, valve caps and look out for cuts/bulges before heading out. If it doesn’t look good, don’t give it the benefit of doubt. Change it. 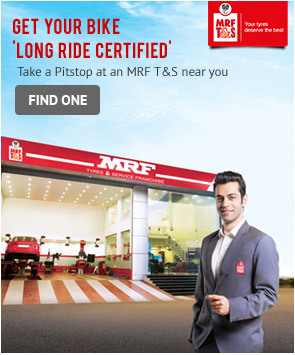 Additionally, go to www.mrfrainritual.com and find out 3 important checks to make your monsoon journey’s alright. 5. Keep your bike chain clean: Puddles, mud, dirt, and muck are all part and parcel of monsoon. In this season, the chain of your bike catches more dirt than usual, this means washing off of the lubricant and grease. Make a practice of cleaning and applying lube before you go out on your journey.